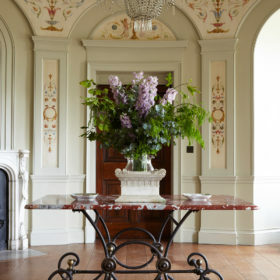 Celebrate life amid the gorgeous grandeur of Goodnestone Park. 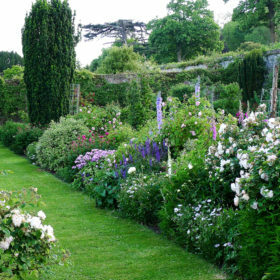 Past the hop gardens and oast houses of Kent, it sits grandly in landscaped gardens ripe for croquet or cricket. 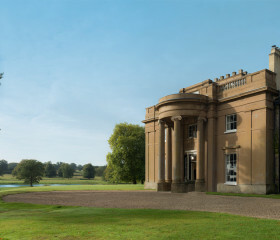 Take tea on the terrace and drinks in the drawing room. Light the fires and feel right at home. 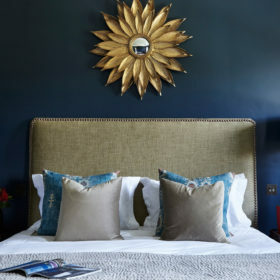 Goodnestone is fabulous without the formality. 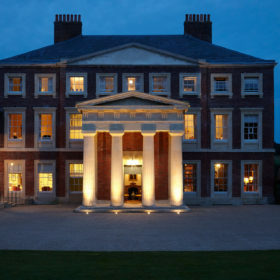 Celebrate life at Goodnestone Park among the hop gardens and oast houses of Kent. 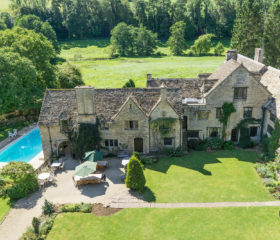 This is as stately as a home gets, beloved of Jane Austen and ripe for croquet on the lawn and drinks in the drawing room. 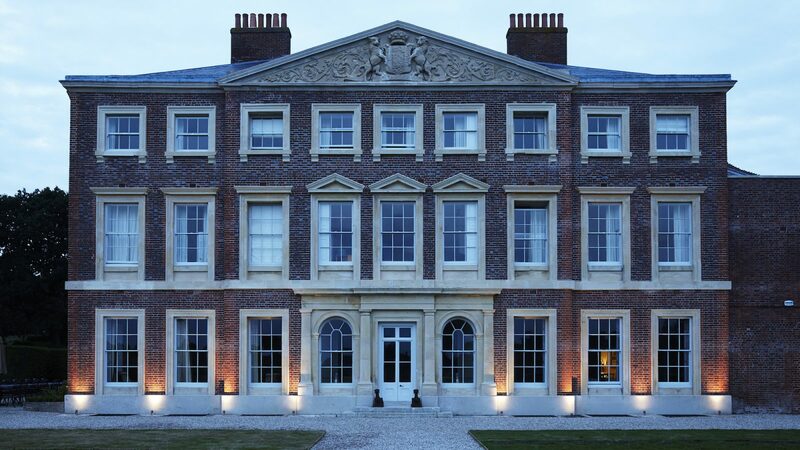 The staircase sweeps, the landing’s galleried, the gardens are landscaped and afternoon tea is served on the terrace. Get a couple of dozen together and follow the gravel path past the topiary, the cricket pitch and the lush lawns. You’ll be struck by the seclusion, the sweeping grandeur and the whole family-seat idea. The 1st Baron FitzWalter led the opposition to King John and was one of the 25 sureties of the Magna Carta. 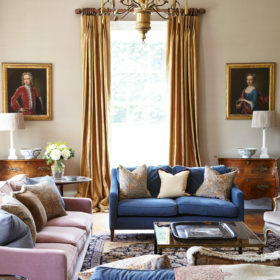 In the family spaces, art and heirlooms sit among the history and the modern Georgian interiors crafted by Francesca Rowan-Plowden and Marcus Crane. 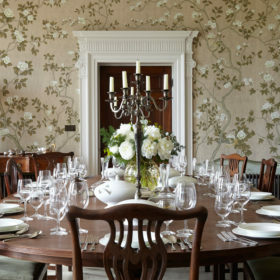 They’ve created a family feel, a sense of lived-in luxury, with shelves groaning with leather-bound tomes and hand-painted de Gournay wallpaper in the dining room. 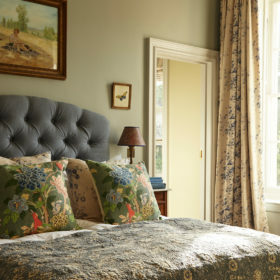 You’ll feel right at home, among the Colefax and Fowler curtains, the plaids and tweeds, and the modern shaker-style kitchen. Settle back, light the fires and get cosy over family games and chatter. Outside, kids will go crazy for the sprawling lawns which croquet and skittles can played. Informal elegance can be a lot of fun. 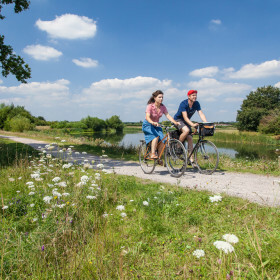 In the Garden of England sits another with something for everyone. 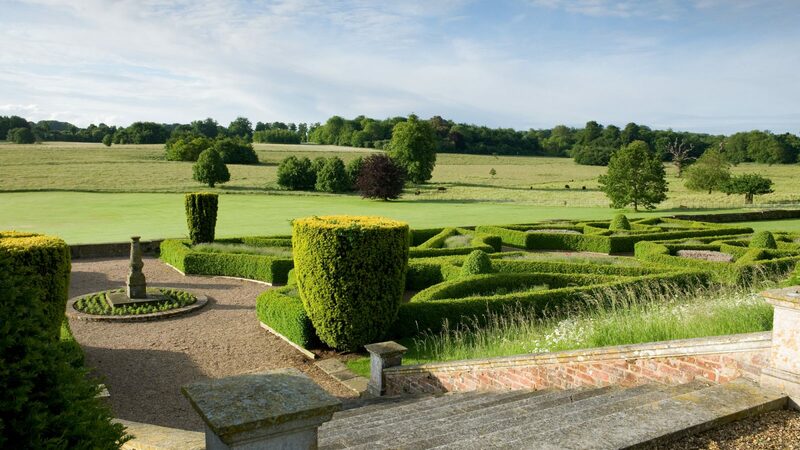 Kids can go wild on the sprawling lawns and grown-ups can take tea on the terraces, cook in the country air, or walk the Serpentine woodland in the ancient steps of Jane Austen. Manicured lawns, woody tangles and the clunk of a croquet mallet or thwock of leather on willow make for a 15-acre English haven. This is Sissinghurst without the crowds, a haven of beautiful English tranquillity, and a place to refresh and renew, deep within the Kent countryside. 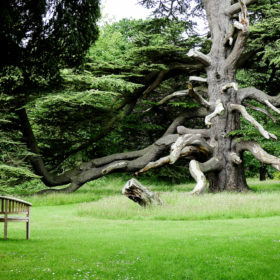 Enjoy one of only three gardens in Kent holding two stars in the Good Garden Guide. 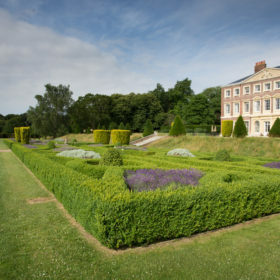 Things are formal near the house, with topiary and a small box parterre, planted to celebrate the millennium. Follow the gravel garden to the woodland area and the Golden Arboretum beyond the wood. 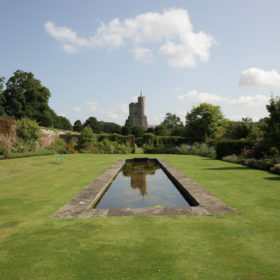 For peaceful escape, walk the walled garden with its water feature and church views. In summer, the scent of roses, wisteria, clematis and jasmine hangs heavy. The kitchen garden is equally impressive, bountiful with fruit, herbs and vegetables. Relax, restore, renew, and fire up the barbie from time to time. 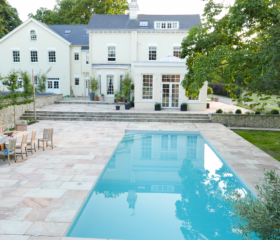 Goodnestone is a theatrically beautiful place that sets a perfect stage for your holiday. 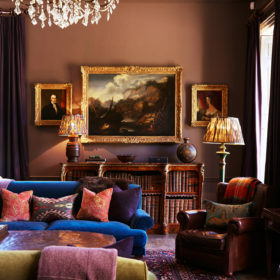 Settle back on velvety sofas among the Colefax and Fowler curtains, family portraits and bold abstracts from local artists. There’s a grand piano for family singalongs and a library full of leather-bound books. 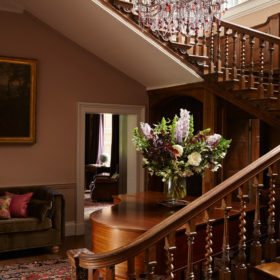 The staircase sweeps its way to the galleried landing and the first-floor sitting room, where there’s a view to be had, and not just of the TV. 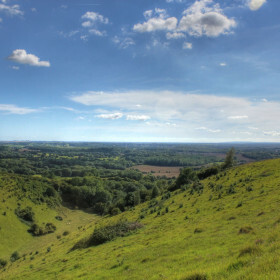 The parklands and woodlands roll forever beneath big skies. 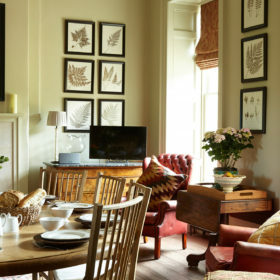 It’s all part of a giant vision of something quintessentially English and aristocratic, a home from an age of gracious living. 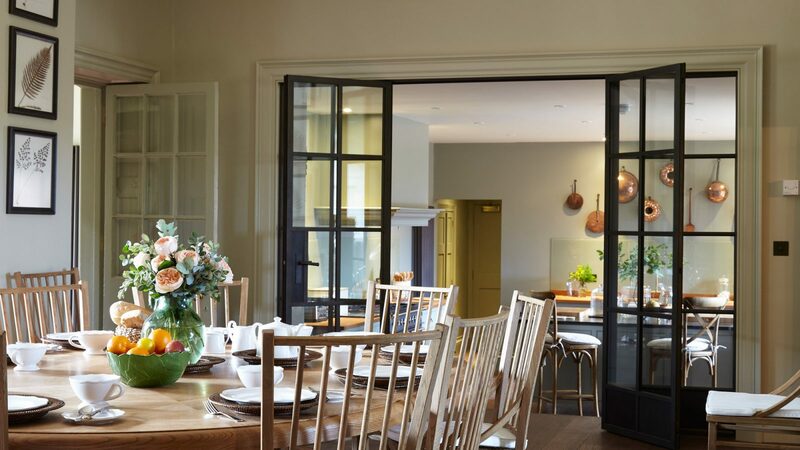 Open up the doors in the downstairs reception room to the country air and the vast terraces. Play board games in the library. Summon up some wifi. Fire up the sound system and stream songs from your smartphone into every reception room. Modern technology sits cosily alongside the discreet grandeur and genteel informality. 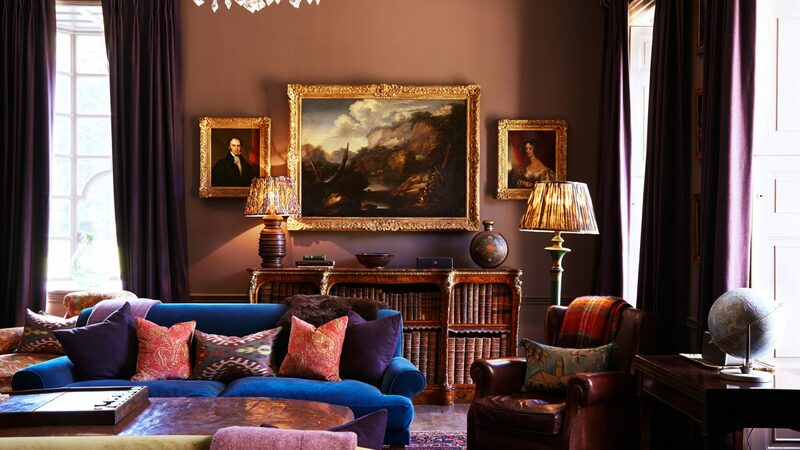 The drawing room’s perfect for parties or pre-dinner drinks. The library’s your secret escape for moments of mindfulness. 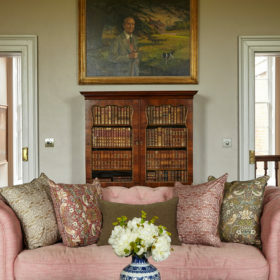 At Goodnestone, history, romance and beauty come together in a place that inspired Pride and Prejudice. Yet there’s a cheeky charm here, too. There’s even a wine fridge where the walk-in safe ought to be. 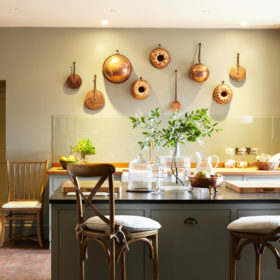 If you’re feeling fresh, local and seasonal, you can make the state-of-the-art kitchen your own. 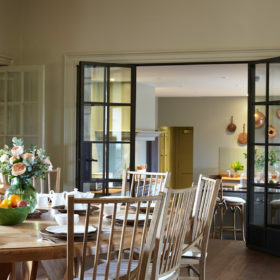 It’s a beautifully crafted, informal hub, open to the diner in a choppy-chatty arrangement that takes the best of 21st-century living, with wine cooler, deep freezers and fridges, and drops it into an 18th-century Queen Anne gem. 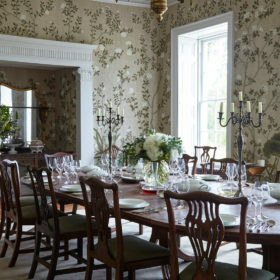 Take drinks before dinner in the drawing room and dine in the grand dining room. Black ties and evening dresses could work well. Especially if you’re hiring in our butler. 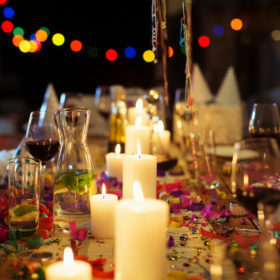 While you’re at it, why not put the catering in the capable hands of Mark Sargeant from renowned restaurant Rocksalt. After dinner, how about some wine-tasting with Hush Heath Winery? Or maybe just pop out to the pub, The Dog at Wingham, The Griffin’s Head, The Duke William, or The FitzWalter Arms. If you’re eating, head to The Duck for sausage cassoulet or hay-smoked ham, or Cumberland sausage or rib-eye steak at the Duke William. In Canterbury, Neil Evans serves sumptuous feasts to delighted diners at Kathton House, The Corner House has the seasonal, sustainable bug, and Caribbean cuisine is thriving at St Smokey’s Barbecue House. In Folkestone, cantilevered over the harbour, Rocksalt has a stunning menu with a side order of ships. 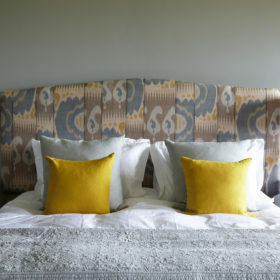 Goodnestone Park sleeps 24 in 12 bedrooms, with a mere 11 bathrooms, in cosy rooms named after family members. On the first-floor, off the galleried landing, the FitzWalter Room is the master bedroom with superking-size bed, far-reaching views of the parklands and en-suite bathroom with rolltop bath and walk-in shower. The Pink Room is a large suite with zip-link superking size or twin beds, parkland views and en-suite bathroom with rolltop bath. 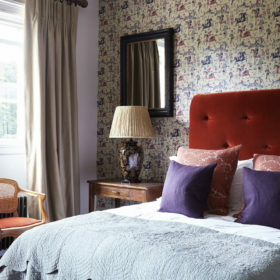 Effie’s Room is a suite with king-size bed, fireplace and rolltop en-suite. The Dressing Room is a king-size, as is the Green Room with en-suite bathroom. Up on the second floor, William’s Room is a zip-link superking size or twin with en-suite bathroom. The Games Room and Francis’s Room both sleep 2 as en-suite zip-links or super kingsize, while Henry’s, George’s and Julian’s rooms are all king-size. 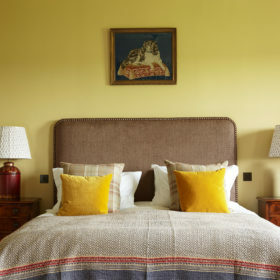 Robert’s Room sleeps two in a king-size with en-suite shower room. There’s a family bathroom with bath, WC and hand basin on 2nd floor and there is an additional cloakroom on the 1st floor with WC and hand basin. 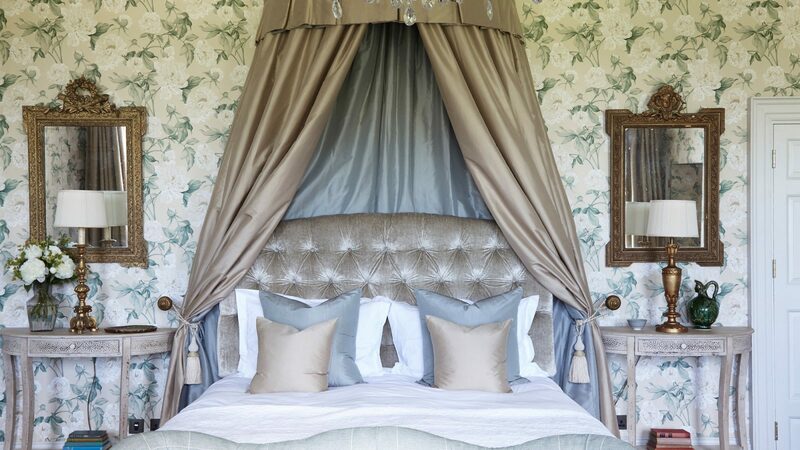 Sleep in the kind of beds you never want to get out of and wake to the sound of the birds and views of parkland, woodland or cricket pitch. 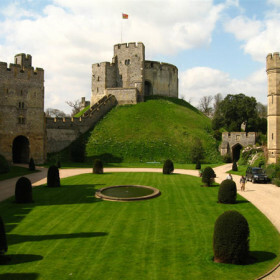 Kids can see Chaucer’s stories brought life at The Canterbury Tales, tour the spooky streets on a Ghost Tour or see wolves and wild boar at Wildwood. 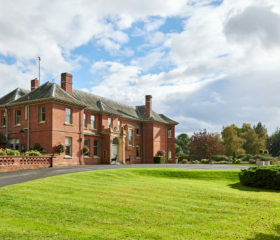 For grown-ups, on-site offers cookery and cocktails, and horse or helicopter rides. Off site, it’s cathedrals and castles, gastronomy and gardens, history and heritage.